One hallmark of a major city is a robust transit system. Think the London tubes or the Washington, D.C., Metro. This summer, the entire country of Luxembourg will become the first in the world to provide free public transit. Pittsburgh would have quite a ways to go to measure up to these locations — and even to its past. Pittsburgh’s transit service is half of what it was two decades ago. Routes have been slashed, and buses run on schedule about two-thirds of the time. This story was produced in partnership with Pittsburgh Magazine. But Pittsburgh’s transit service actually compares well to others — for example, 138,000 Pittsburghers live within a half mile of public transit, ranking it among the top with other major cities in the U.S. — and the Allegheny County Port Authority has a lot of improvements planned for the region’s bus and trolley system in 2019. Others with a stake in varying issues — from fair housing to the air quality — are also working to effect change by focusing on public transit. Public transportation is a critical component of the discussions on economic development, affordable housing, food access, the environment and health care. Here are six people thinking about those very intersections and working to design policy that will be equitable for everyone. Port Authority CEO Katharine Eagan Kelleman is preparing to make changes to infrastructure and technology in the coming year. Her plans include replacing 70 buses, renovating several bus shelters and T stations and rolling out a new website and mobile app. 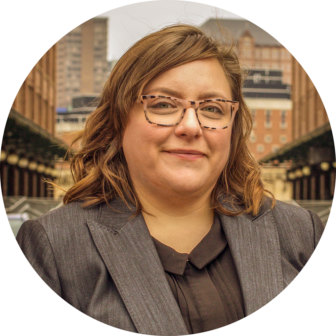 Kelleman and her staff are designing both short- and long-term plans for how to make the buses run on time, integrate transit with development and make fares more equitable. They’re hoping to accomplish all of this after absorbing an unexpected funding shortfall. The Pennsylvania Department of Transportation told the Port Authority in August that it would be receiving $75 million less in state funding this fiscal year due to an ongoing lawsuit related to the state Turnpike. Kelleman is pushing ahead. She says the Port Authority would start working to upgrade the internet connectivity on its buses from 3G to 4G, which could allow for easier use of its magnetic Connect fare cards and eventually the use of technology to do so-called “fare capping,” a system where people paying for individual trips save money once they’ve ridden the bus or trolley a certain number of times in a week. (Once a rider paying for individual trips has spent the equivalent of a weekly pass or a monthly pass — whichever is used — they ride for free the rest of the time.) The change also could allow riders to access free wifi while riding the bus. an overhaul to its timetable to increase its on-time rate from 67 percent to 73 percent. For Crystal Jennings, transit and housing are intricately linked. “You can’t have one without the other,” she says, explaining that where a person lives and how they get from there to work, grocery stores and doctor appointments are codependent. And for low-income people who are increasingly moving out of the city for cheaper dwellings elsewhere, the intersection of transit and housing can have a grave impact on life. For example, Harvard researchers have connected commute times with the ability to escape poverty, and other studies have linked lengthy commutes with health impacts, such as depression. 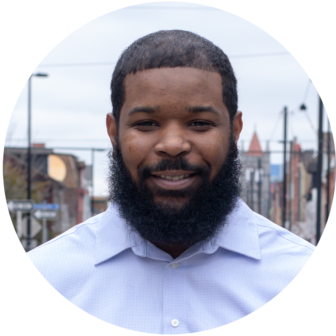 As the transit/housing organizer for Pittsburghers for Public Transit [PPT], a nonprofit that advocates for better bus and trolley service, Jennings hears stories of people struggling to navigate housing and transportation firsthand. Myrtle Stern — known affectionately as Ms. Myrtle — was a resident of the former Penn Plaza apartments in East Liberty. She was displaced when the building was torn down last year. First she moved to Verona and then to Homewood. Stern, who’s in her 70s, needs public transit to get to the doctor and to visit family. The stress of her multiple moves along with learning new bus routes is unhealthy for her, Jennings says. For others, lacking reliable public transit can set off a domino effect — no ride to work leads to no income, no income leads to not being able to afford groceries, child care, doctor’s appointments and so on. Until now, local data on housing displacement as it relates to transit hasn’t been plentiful. 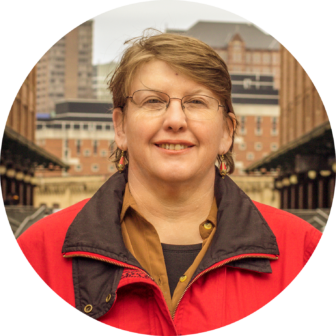 Over the past year, Jennings has worked to conduct surveys of low-income people about their housing situations and what kinds of transportation they use day to day. She’s collected data from 70 people so far and is working with Carnegie Mellon University’s CREATE Lab and a student group called Tech for Society to crunch the numbers. One woman Jennings surveyed says she was forced to move to Penn Hills from East Liberty after her Section 8 voucher expired. The woman’s rent doubled when she moved, as did her transit costs. Where getting to work, child care, social activities and the grocery store used to cost her $27 to $37 per week riding Port Authority buses, it now costs her between $50 and $62. She says her housing and transit costs can eat up 45 percent of her budget some months. Then there was the single mother who used to live in the city but left for Wilmerding because of cheaper housing. The woman has medical appointments in Oakland and relies on Port Authority buses to get there and back, she told Jennings. According to Google Maps, the Route 69 bus connects Wilmerding to Oakland directly but comes only once an hour. The 12-mile trip takes at least 50 minutes, not accounting for traffic. If the 69 isn’t running, the trip can take longer and require transfers that incur more fees. According to Port Authority data, about 41 percent of riders earn less than $35,000 per year. Almost 20 percent of riders are non-white. Jennings says she wants to take her data to the Port Authority, city and county housing authorities and other local leaders to show them how displacement affects low-income people. 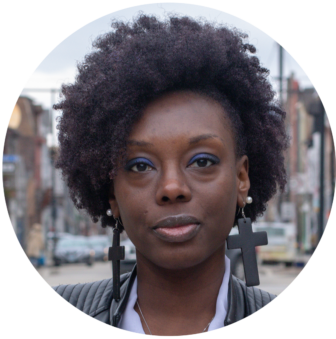 “...this is what’s happening to our people when they get pushed out or priced out or gentrified out of their neighborhoods and this is what they're losing,” she says. As Jennings continues her work, her survey data will be included in Pittsburghers for Public Transit’s advocacy work as it pushes for affordable housing near improved transit. And as part of its “Make Our Fares Fair” campaign, PPT wants the Port Authority to reduce the cash fare to $2.50 from $2.75 and to introduce fare capping, which is on Kelleman’s list. “Even if you live a good life, I know you know somebody that's not in a good position so that should make them want to fight for those other people even if they're not affected,” she says. Could the Port Authority be a conduit to Pittsburgh building more affordable housing? It’s possible, according to David Huffaker, the agency’s first chief development officer. He was brought on in September to start working on everything from improvements to bus shelters to designing 20-year plans. 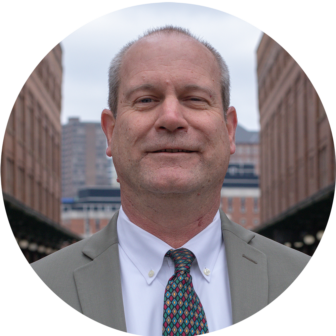 One of Huffaker’s tasks is getting the Port Authority to prioritize Transit-Oriented Development, or TOD. It is the idea that transit (e.g. bus routes) and development (e.g. a new apartment building) can be planned side by side to ensure that communities and residents are better connected. Huffaker says the Port Authority has begun working on how to better support affordable housing through its transit work, whether that’s having routes serve existing housing or by supporting construction of new housing near existing routes. One possibility that Huffaker is looking at is working with a developer to build affordable housing near the Port Authority’s East Busway, which runs from the East End of the city to Downtown. The authority owns land near the busway, so it could potentially sell or lease the land to a developer and stipulate that a percentage of the development be affordable housing. That way, when people move in, they’ll have easy access to one of the most direct transit lines to Downtown. The more common way TOD will manifest at Port Authority, though, is by having an ear on the ground for development happening in the city, Huffaker says. If the Port Authority learns of a development planned for a particular area, it could work with a developer to improve its bus shelters and stations or reconfigure bus or trolley service to meet the needs of people in that area. But it’s not just developers Huffaker is interested in working with, he says. Since he moved to the city in August from Seattle, he’s been meeting with community groups and advocacy groups such as Pittsburghers for Public Transit to learn about their needs and wants. He says meeting with everyone who has a stake in transit is how the authority can better design its service. As Helen Gerhardt sees it, buying and eating healthy food isn’t just a matter of going to a store and choosing vegetables over chocolate. Rather, it’s a much more complicated matter that involves where you live, whether or not there are stores nearby and how you get to them. Gerhardt spends a lot of time thinking about how transit intersects with how people access food. She uses herself as an example: When she was working two jobs as a janitor, she was clocking about 65 hours per week. To get through her shifts, she’d eat candy bars — not exactly the healthiest of options. But it was convenient food with a shelf life. It takes time and money to make frequent trips by bus to the grocery store for fresh items. “As displacement moves people away from critical amenities such as food, the various burdens on those populations increase,” she says. That’s why Gerhardt and the food and health equity committee of the Pittsburgh Food Policy Council want to see local government agencies take food access into consideration when they’re planning new bus lines or developments. Gerhardt and others are developing a rubric of criteria and questions that the Port Authority, the city, the Urban Redevelopment Authority (URA) and other bodies could use when making plans for transit or development. Government could turn to available data and evaluate its plans in terms of food access before acting, she says. The rubric should be completed and rolled out sometime this year, she says. 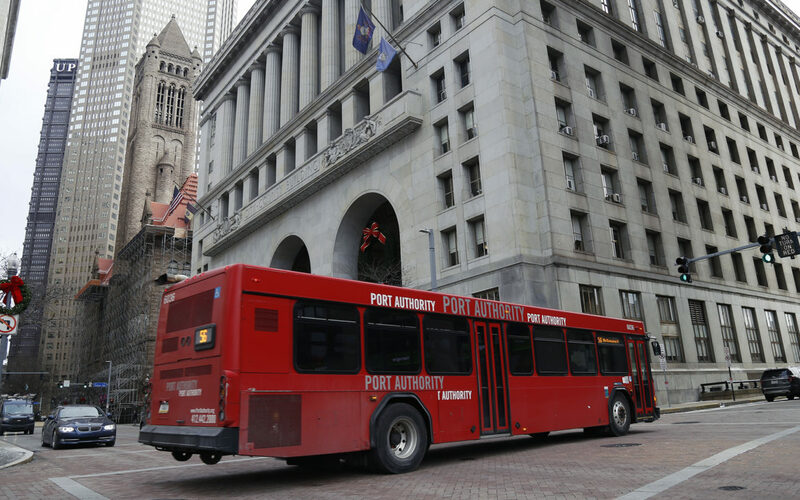 Gerhardt, who used to work with Pittsburghers for Public Transit, is joining that group’s effort calling on the Port Authority to lower the cost of fares when someone is paying with cash and to make bus transfers free. “It is the lowest-income people that are bearing the highest burdens with the current transfer system,” she says. When outsiders talk about Pittsburgh, they often describe a city that’s revitalized itself, shedding its blue-collar past for a future full of “eds and meds” jobs. But Joshua Malloy knows firsthand that for workers at UPMC, as well as the patients who need to see doctors and specialists, simply getting there can be a challenge. As a former employee at UPMC and now an organizer with Pittsburghers for Public Transit, he sees the intersection of transit and access to the region’s doctors and hospitals as a point of concern. Malloy, who worked for UPMC for six years, spent four of those years organizing a labor union. He says he knows hospital workers who were displaced from their homes and had much longer, more expensive commutes to work as a result. The same is true for patients — the farther people live from UPMC facilities, the more costly it is to visit. The farther one lives from the city core, the fewer direct lines there are to UPMC facilities and fewer Port Authority Connect Card kiosks. If a person can’t load money onto a Connect Card, they have to pay cash; Port Authority charges cash riders more. When people find themselves in those types of situations, Malloy says they have to make hard choices. “Am I going to the doctor or am I going to go to the grocery store or am I going to go to the pharmacy? Those are choices Port Authority shouldn’t be putting people in,” he says. Along with Jennings and others at the organization, Malloy is lobbying for fare capping and lower fares for cash riders. Malloy also says because UPMC isn’t required to pay local property or income taxes because of its nonprofit status it should have to pay toward things such as buses and road repairs. Pittsburgh used to be the smoky city. Now, it’s the city with a mayor who defies the president of the United States to declare commitment to fighting climate change. How does public transit factor into that? In the last year, PennEnvironment, a statewide environmental advocacy group, has published two reports detailing the environmental impacts of electric cars and electric buses. If the Port Authority replaced all of its 727 buses with electric vehicles, it would be the equivalent of taking 4,464 cars off Pittsburgh’s roads, removing 23,121 tons of greenhouse gases from Pittsburgh’s air each year by transitioning to an all-electric fleet, according to one of PennEnvironment’s reports from May. 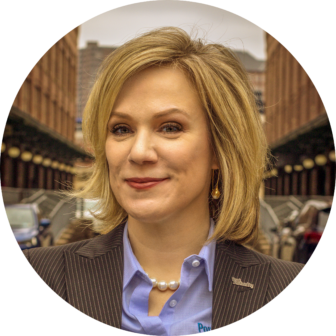 Ashleigh Deemer, the Western Pennsylvania director of the group, outlines two big goals when it comes to electric vehicles: Get Pittsburgh to use them, and then get the electricity used to fuel them to be made from solar and wind energy, rather than carbon-based sources. Port Authority has plans to roll out its first two electric buses, spokesperson Adam Brandolph says, and is applying for grant money to purchase 25 more electric buses for its Bus Rapid Transit project. After PennEnvironment published the study, it communicated with the Port Authority and agreed to write a letter of support for the agency to bolster its application for a grant to procure four additional electric buses. Deemer says she’d like to work with the Port Authority to establish a broad plan to replace its buses with electric vehicles as the agency continues to update its fleet. Port Authority plans to replace 70 of its buses in 2019, according to Kelleman. Deemer notes the agency could also save money in the long run — electric buses have 30 percent fewer parts than diesel buses and thus require less maintenance. She cited Chicago as an example of a city that had successfully begun to use electric buses. Jon Kaplan, a spokesperson for Chicago’s Transit Authority, said the city began piloting electric buses in 2014 and is rolling out 20 electric buses in 2019. “In addition to providing a cleaner and quieter ride, electric buses reduce fuel costs and significantly decrease emissions,” he wrote in an email. Deemer is hopeful Pittsburgh will follow a similar path. Photos by Douglas Duerring for Pittsburgh Magazine. J. Dale Shoemaker is a PublicSource reporter. You can reach him at 412-515-0060 or by email at dale@publicsource.org.